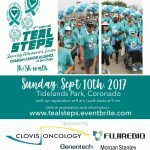 Our Sincere Thanks to all of the Sponsors and Attendees of the Second Annual Teal Steps Walk held at 8 AM September 10, 2017, Tidelands Park, Coronado! The Ovarian Cancer Alliance of San Diego hosted a pop-up exhibit at West Elm, Mission Valley, California. 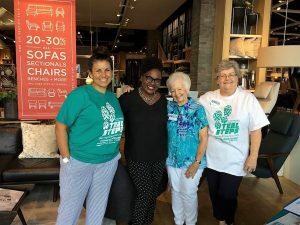 It was a busy time as Cindy Silver and Peg Ford shared information and materials describing symptoms of not only ovarian but all gynecologic cancer and risk factors as well as answered questions to West Elm’s customers on Saturday and Peg and Kathy Hagan did the same on Sunday! Amazed that on Saturday, two young women shared (photo) that they are ovarian cancer survivors and, most wonderful and extremely rare, they were both diagnosed at early stage!!! They joined Peg who has always considered herself blessed as she was diagnosed at Stage I at the age of 60 in a photo with Cindy (who is a Stage IV 9+ year survivor)!!!! Diagnosed at early stage increases the overall 5-year survival rate to over 90%!!! Our mission is to get awareness out to empower women and their families to be aware of the symptoms and risk factors to save more women’s lives. In addition, individuals registered for the upcoming 2nd Annual Teal Steps 1K/5K Walk including one who set up a team!!! Our thanks to West Elm for this opportunity to get awareness out into the community. One of the great traits of Coronado resident Peg Ford, is her indomitable spirit. 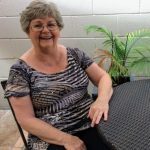 The Toronto, Canada native is approaching her 50th year living in the United States and holds dual citizenship in the two nations. 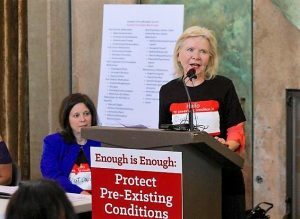 A survivor of Stage 1 Ovarian Cancer, the 70-year old Ford has transformed herself into a nationally and internationally-renowned Cancer Research Advocate and Patient Representative, and is the co-founder and president of the Ovarian Cancer Alliance of San Diego. Ford is in constant pursuit of promulgating the once radical concept for cancer survivors to have a voice in their treatment options. On Sunday, July 30. 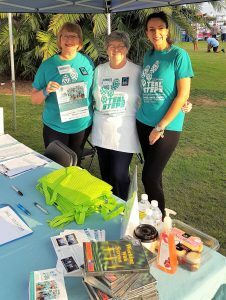 2017 at Waterfront Park in San Diego three of our members, Barbara Horton, Peg Ford and Renata Lutz (photo to the right, wearing T-Shirts from our last year’s Teal Steps 1K/5K Walk) hosted an exhibit booth at the Live Well San Diego 5K. The event was larger than last year and activity at the booth was hectic and lively with unfortunately too many people sharing they lost or knew of a woman dealing with ovarian cancer. 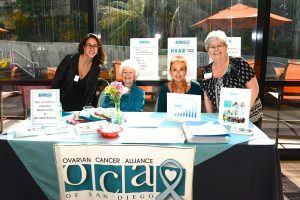 Women of all ages were introduced to community outreach programs of Ovarian Cancer Alliance of San Diego receiving the Symptom Diary in both English and Spanish not only for ovarian cancer but also all gynecologic cancers’ signs and information on our upcoming walk! In addition, we were able to accept paid registration from several individuals to participate in the upcoming 2nd Annual Teal Steps 1K/5K Walk; others signed our volunteer list to get involved!!! The photo to the left shows Renata Lutz, Cindy Silver, Naomi Edelmuth and Peg Ford hosting OCA of San Diego’s exhibit table at the event. Other members who hosted the exhibit table were Barbara Horton and Trupti Multani. Peg Ford was invited, and accepted, to become a member to the Community Advisory Board (CAB) of Sanford-Burnham’s National Cancer Institute (NCI)-designated Cancer Center. Board members serve the Center’s mission through their passion for advancing translational research and their determination to raise awareness and support.